Weight Watchers has launched a new product for 2013. How is it different? The good news is that you can keep your books, PointsPlus calculators, and favorite recipes from the past PointsPlus program. Weight Watchers has not changed any of their algorithms or adjusted their eating plan so all the PointsPlus program materials will work with Weight Watchers 360°. What is new is that they are not only trying to offer you advice on your food habits, but tools to keep track of them as well. The 360° concept is that you are going to look at food intake, mindless eating, how you organize your kitchen, celebrations, healthier breakfasts, etc. to aid you in weight loss. If you have ever been to a Weight Watchers meeting then you know that the leaders are always giving advice on how to tackle your bad habits. Now, Weight Watchers has added some online tools using adult learning principles to help keep you accountable and build NEW healthy habits. There are 16 different routines that they have constructed to help you get healthier and they are offering advice on how to design your spaces (kitchens, workplaces, cars, etc.). They have also added a section just for men (I guess the program is too female focussed for the guys out there). For me, habits around eating have been as important as what I eat in aiding in my weight loss. Also, there are a ton of great applications for our cute handheld devices for helping you form new habits. While I still use the old pad and paper because I am old, I am sure WW has come up with some cool apps to support your healthy shifts. Weight loss really isn’t just about the food. Weight Watchers has said that for years and now has created online tools that will help you be accountable. Think of Weight Watchers 360° as an upgrade on their PointsPlus program, not a big change that will make it hard for you to follow something new. I still love that they emphasize eating fruits and vegetables. You can't go wrong eating healthier food. The real question is whether Weight Watchers helps people lose weight and keep it off. There is a recent published scientific study done by independent researchers (not funded by WW) that has shown that their new program is effective. Weight Watchers isn't cheap so if you take the dive, be sure to commit so you have a chance of learning from it and losing weight. 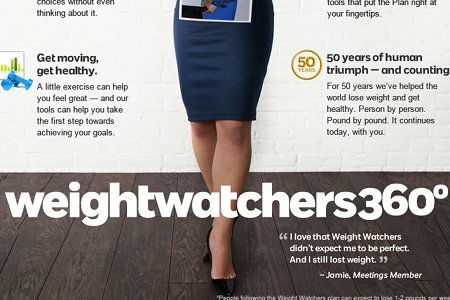 Have you tried Weight Watchers 360°? What do you think? How about PointsPlus? Please share. Looking For A Free Version of Weight Watchers? Is your financial belt tightening as your actual belt is tightening? Unfortunately, Weight Watchers isn't free. Is Weight Watchers’ PointsPlus Working For You? I have lost 65 lbs. at WW. I think it is a great program but like anything, you get out of it what you put in. I agree that you really need to be committed if it is going to help you lose and then keep the lbs off. I'm not to maintenance yet but I think it will probably be the most difficult of all but also probably the most important. We have ALL lost weight but keeping it off is another story all together!! Good luck and by the way, it is well worth the commitment. I have 40 lbs to go but already feel so much better. I am off several meds and all my labs are better as well. My "just graduated college" budget's cannot afford WW at the moment, but my colleague has lost 80 pounds with the program. I have lost 50 pounds in the last year with WW. I think it is a mind set. Once I realized it is not a diet but the rest of my life I found it easier to do. I still have 10 pounds to go to goal and then maintenance. I highly recommend WW. That first step is the hardest and after that it actually becomes fun. Every little goal is a challenge that you CAN meet and before you know it your health, your confidence and your life are so much better. I lost 40lbs. Feel great and look great. Weight Watchers helped me understands potion control and kept me accountable for what I was putting into my body. I HIGHLY recomment it to anyone beginning the weight loss journey. If you do the plan and stay on plan, you will lose weight AND keep it off. I am a lifetime member of WW. Maintenance is extremely challenging if you don't make this a lifestyle change. Fortunately for me I LOVE fruits and veggies and whole foods in general. This puts me in the Power Foods user category and also the older Core Plan. I don't feel deprived - still have a glass of wine and a dark chocolate every evening. BUT - as we age, exercise is critical. I am 64 and enjoy deep water aerobics classes 3 times a week. Finding some aerobic activity that is fun is crucial to a success story. There are no tricks to losing weight - just smart choices. Good luck! Nice post, I really don't know much about weight watchers and I have been intrigued by there program. Thanks for sharing!! I just went back to WW....I had lost 65 pounds, but then I lost focus. I never gave up, though, so here I go again. This newest plan has a slightly-different focus, but it all makes sense. I'm not a veggie fanatic, but I'm working on it! Nothing is "off limits" which does help with cravings (in moderation!). To restate what's already been said, if you work with the plan the plan works for you -- I've lost 9 pounds in two months, hope to lose 9 pounds in the next two months, etc. To me the monthly pass makes the most economic sense, and a good leader is essential - if you don't "click" with the first one you meet, you should try another one. I love my leader, but the woman who fills in for her is SO scary...! I am a Lifetime member of weight watches. I have been involved with weight watchers for 34 years. Like most of us, I have rejoined a number of times. Losing the weight was not a problem and the program works well, however keeping it off seems to be my problem. The most recent joining was last Jan with the mew points plus prog. I lost 30 lbs, but since then I have put on 20. What's my problem? I think it's my husband. He has such a sweet tooth for cookies, candy (M&Ms) and cakes. Constantly buying these items which undo my healthy habits. No willpower. I've never done WW, I've always done calorie counting and today with the tools online, I can watch calories as well as carbs, fiber, protein and fat with little effort and no mind numbing calculations and flipping through calorie books! The comment I'd like to make though, is that any eating change needs to be a lifestyle. It's about frame of mind and accountability. They offer "WW at Work" where I work, but they are in sessions. This seems to indicate that watching your weight is only in sessions. I know WW helps millions of people reach their goals, but staying in WW can become quite costly and when there's no one to be accountable to, it's so much easier to fall off the wagon. Maybe WW should add weight maintenance accountability sessions at a reduced rate. I have lost 60lbs on weight watchers and have only invested $60. I just bought 2012 the delux kit on amazon. Spent $.99 on a small notebook to journal my food and I have been doing great. 40 lbs to go to goal. I have lost 38.5 pounds on Weight Watchers and am now at my goal weight, transitioning to maintenance mode. It works beautifully if you actually follow the program and stay disciplined about it. That old thing that your teachers used to say, "you're only cheating yourself"? 100% true. You only hurt yourself by cheating, and it just takes longer if you do. And you do have to get used to the idea that you might not feel full to bursting all the time, and that it's actually okay not to feel full to bursting all the time. You don't starve, you eat real food, and the flex points make it flexible enough to accommodate those times when you don't have complete control over what's available to eat. I lost 60lbs with weight watchers (and running) two years ago and have since kept it off. When ever I feel like in going a but over board with eating, I jump right back on to point tracking. I've been over weight my entire adult life and WW is a big part of that. LIfetime member here, who just got back to goal. I lost 126 pounds to get back to goal. When I work the program, it works for me. I love WW, especially the Simply Filling Technique, which is what I follow (stresses cleaner eating). I feel like I can eat this way for the future! I feel a little ridiculous commenting alongside the people who have lost 60 or 100 lbs, but there are also those who just need some encouragement to adopt healthier food choices and lose that little bit. I have been watching my weight slowly creep up ever since I hit 30, but last year I had had it, and it was buy new clothes or lose 20 lbs. Well, I joined WW online and did the points plus program. The weight did not want to leave at first, and losing a pound or two each week felt slow at first, but the 20 did come off, and has stayed off, because I learned healthier habits. Reading SG's blog is also a big help. I have learned ways to cook and try different vegetables that I would never have eaten before. My family is benefiting, too, since I am the cook in the house. And my clothes fit again. Another successful Weight Watcher member here at 130lbs lighter and now at Lifetime. I reach my goal weight in Sept 2012 and I already know that if it wasn't for WW continuing support for those at maintenance I would be gaining what I lost! I think the monetary amount that I have invested is priceless for a better health and much cheaper than surgery, where you can still gain the weight back!!!! Weight Watchers WORKS! I lost 60 pounds with WW over 4 years ago. I met my Lifetime Goal within 1 year and have kept if off ever since! I tried everything else. This planis for real people with real lives. The flexibility and the knowledge you receive will set you up for success as long as you are committed to being the Best You you want to be! Love WW!!!!!! Ten years ago I took off 40 lbs. with W.W. "Core" plan. It worked very well with me because I love vegetables and fruits, and at the time, you could eat all you wanted. I've kept the pounds off, and the best advice I heard was to just not bring into the house what you know is your temptation, and do keep handy what you know will satisfy your cravings -- for me it's low fat yogurt, popcorn (from scratch) -- with a sprinkle of garlic salt and grated Parmesan or Romano cheese, and for my sweet tooth, fat free meringue treats. You won't be healthy eating a bunch of fruits and vegetables. You need a well-rounded diet; LOTS of healthy fats are absolutely crucial. I wrote about this just a couple days ago: http://www.anorganicwife.com/2013/01/be-healthy-360.html and I swear, I did not know that WW was calling their new program 360°! I lost 80 lbs but have gained most of it back due to injury and loss of focus. I now employ some of the WW tips but use a free online tool called Loseit and formed a FB support group with my friends. I find that if I have support and write it down, I can be successful without spending money. WW is a good group but I found that the community was judgmental and didn't want that in my life.